Earlier this week I went along to the ALT Winter Conference CPD Rebooted – Creative Professional Development for Learning Technology and, as is always the case with ALT events, I came away with a great deal to think about. There were some excellent presentations; Nic Whitton’s talk on games in education was particularly fascinating. I’m not a gamer myself, but I’m very interested in the affordances of playful learning and games in education. David Hopkins, Clive Young and James Keift also gave three excellent presentations on CPD for learning technologists, career progression or lack thereof, and routes to CMALT accreditation, however I came away with a nagging feeling that much of their good advice didn’t really apply to me. In some ways this is related to the debate about “what makes a learning technologist?” that recently took place on the ALT-Members mailing list. I’m not even going to attempt to summarise what was a lengthy, wide ranging and very considered discussion, however one contribution that I particularly identified with came, as it often does, from Amber Thomas. In a blog post called Perhaps I’m not one?, which aimed to “give a voice to other learning technologists who feel like they don’t fit the standard description”. Amber pointed out that learning technologists come in many different flavours and all make a uniquely valuable contribution. Which brings me back to the thinky thoughts raised by CPD Rebooted….It seems to me that there is a distinction between the various flavours of learning technologists who are employed by colleges and universities and whose primary remit is to support and develop the use of education technology within the institution, and those that are employed by advisory services, for want of a better word, and who have a more sector facing role. I realise this is a bit of a sweeping generalisation, but I think the former group of learning technologists have quite different opportunities for, and experiences of, career progression and CPD than the latter. In fact I might even go so far as to say that the latter group have very little opportunity for planned career progression and CPD at all. With advisory services being axed left, right and centre (TechDis was the latest in a long line of invaluable service to be despatched this week) many highly experienced professionals are increasingly finding themselves in the position of having to jump from one short term contract to the next. What does effective CPD look like for colleagues who may have little say in how their career progresses and who lack the job security to plan any kind of professional development, continuous, creative or otherwise? Of course you could argue that scrambling from one contract to the next is in itself a form of CPD, if a rather extreme one! I’ve worked in education technology for over fifteen years, for much of that time as a researcher employed on short term contracts. During that time I’ve undertaken very little formal CPD, although I do try very hard to be an open practitioners and my skills have certainly developed through the many projects I’ve worked on. I’ve never sought any form of accreditation or certification, as these skills don’t seem to fit into the kind of boxes that often make up accreditation frameworks, which circles back again to the points that Amber raised in her blog post. All of which makes me wonder if there is more of a role for ALT in providing innovative routes to creative professional development for people like me who don’t fit neatly into the boxes and who often have very little control over how their career progresses? I should confess at this stage that it’s a while since I’ve had a proper look at CMALT, so it’s quite possible that CMALT already does all of this and I am just woefully behind the times :} That said, I’d be very interested to hear how other colleagues in a similar position manage, or even just think about, their own professional development. This entry was posted in higher education and tagged altc, cpd, higher education. Bookmark the permalink. Lovin’ your thinky thoughts!! I know exactly what you mean, having left the world you describe and finding myself in a situation where I really have to do CPD. Like you I hadn’t really thought what I did fitted neatly into any of the more formal, recognised CPD routes such as CMALT and the HEA. 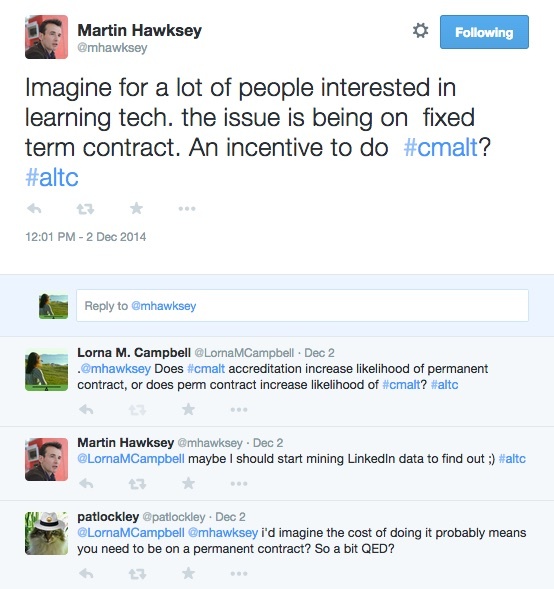 I think you could easily fit your work into the CMALT portfolio route – it’s just a question of time and money. There is lots of community support co-ordinated by ALTfor the application process too. I think that it would be a very good idea for CETIS to register all its staff for CMALT before February!! I guess you have to decide if you think it is worth your time and effort to do it. Re the HEA that is harder if you aren’t in an institution. We have a portfolio route here at GCU for more “experienced” staff which I am doing, and I hope to “repurpose” much of my HEA application for CMALT. What is interesting about HEA is the notion of continuing CPD after formal accreditation of Fellow status. As you said you are an open practitioner and your sharing of what you do already supports and promotes your “good standing” and continued contribution to developments in educational technology. I think many other ‘traditional’academic staff, would find that very difficult. I think this is where the notion of digital scholarship needs to be extended and recognised more. Publishing papers isn’t the only way to contribute to the wider academy. Thanks Sheila. I really ought to look at CMALT :} As you rightly said time and money are the issue, time in particular. If it’s a choice between trying to secure a new contract or applying for a new job, or applying for something like CMALT, then unfortunately the former always wins over the latter. Still, perhaps that’s all the more reason to do it! Interesting point re open practice supporting and promoting “good standing”. I’d never really thought about it like that before. I certainly agree that we need much greater recognition of digital scholarship and open practice. In some ways this goes back to one of the points made in Amber’s original blog post – that there is still a tendency to rate “actual teaching” above other kinds of practice. Definitely think there’s a role for ALT here in promoting and supporting all forms of digital scholarship and open practice. Thanks for this great summary and thought-provoking piece. As I said in my talk it wasn’t until very recently I even considered myself that I’d been taking part in CPD .. I was just trying to find out what I was doing and do it well. I started and completed my CMALT as something I knew I could work at and show my abilities in some formal and recognised manner, in order to prove I know what i’m doing (or think I do). I was certainly never given time in my daily schedules to do this and often found time in evenings or instead of taking a lunch break. This is not ideal but something I hear many people saying, so we are not alone in this sole-CPD push. I completed a PG Cert Education Practice in 2011 specifically as it gave me FHEA status, but I admit I’ve not done anything with it or taken it any further … and not sure what I would do with it either. The event was good, and I’m glad you enjoyed it too, but it also raised questions for me about ‘what’s next?’ Where do we go if (a) we’ve got CMALT, (b) don’t want CMALT but want to progress, or (c) just want to further ourselves but not necessarily academically? Thanks for your comments. I certainly agree that CPD is often relegated to evenings and weekends, although as contracts get ever shorter, weekends are frequently spent working on applications now! However that is a problem that is common right across academia and is certainly not unique to those working in learning technology. In terms of “what’s next?”, I think what’s important is that accreditation frameworks continue to evolve so that they are able to recognise and reward the full diversity of academic practice and all the different “flavours” of digital practitioners. The idea that accreditation frameworks evolve to recognise different ‘flavours’ of practice or professionalism is a good one. I wonder how this would/could work in practice?